#HappyMoonBathEssentialsHighPressureShower This is a really nice 6" Rainfall Shower Head by HappyMoon. 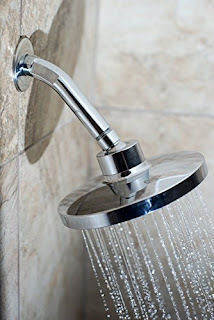 I don't have a lot of water pressure but it builds up pressure for a great shower and rinsing your hair is so easy. It's self cleaning, it has silicone rubberized nozzles to resist hard water deposits and calcium build up. This is an Eco friendly shower head. It conserves water without sacrificing performance with 2.5gpm. It uses standard plumbing connections. I was really surprised at the way the water flows from it with the low pressure my house has. I am completely satisfied and highly recommend it.